You know how Facebook pops up memories into your news feed from years ago? Suddenly before your eyes you see where your life once was, a memory that you might want to share to remind everyone else that you know that time is passing way too fast! Today the picture in my newsfeed was of my boys as babies. It's hard to imagine that they were once small enough to hold and sit on my lap now that both of them are almost if not over 5 feet tall. So much has changed and yet there are moments in our daily lives that haven't changed at all. 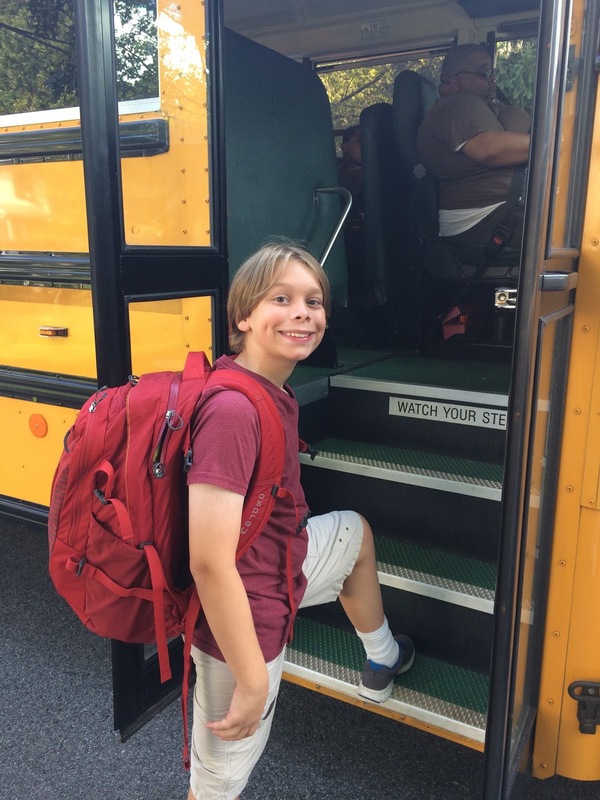 Logan, my oldest child who is on the Autism Spectrum, is now in middle school. We have the same script as we are about to depart each other as we did when he was in kindergarten. In elementary school I stood at the top of the hallway, Logan refused to be dropped off with the rest of the kids in the front of the building, which was OK by me as I enjoyed having that last moment together just as much as he did. We had a routine that we did everyday. Memorized lines we would say to one another. It made him feel "safe" he told me once. We would stop at the mural and I would kneel down for a hug and kiss. I'd use that moment to remind him of something in his backpack that he needed to give his teacher, practice his clues one more time for his Friday mystery bag item etc, etc. I then would say "Have a great day sweetie", he would reply "OK take care of Dharma and Zane for me." "Okay I will", I would respond. On one particular day he turned to walk down the hall, waving his left hand goodbye but not looking at me... as he did every school day. But this time he turned around, tears in his eyes and ran back to me on the verge of completely breaking down. A huge smile then spread across his face. A deep sigh of relief. He turned to leave again. Our script hasn't changed all that much, instead of standing at the mural I stand at the bus stop. And instead of saying "Take care of Dharma and Zane" he says "Have a good yoga class, Mom. ", marking my transition from Stay At Home Mom to Working Mom. Today as he stepped on the first step of the bus, waving his left hand goodbye but not looking at me he paused and turned towards me. I smiled at him instantly acknowledging how grown he looks now and said, "You're going to be great!" A smile spread across his face and instead of his usual line "I know, Mom." He said "You are too." Thanks Logan. Sometimes we moms need to hear it too. For all you moms out there parenting kids on the spectrum; memorizing scripts, living by routines and wishing your child would eat something new.